A Timeless Craftsman Style In A Stunning Natural Setting. Offering over 3,700 square feet of luxurious living space in a forested cul-de-sac above Lake Sammamish, this beautifully designed and elegantly appointed contemporary Craftsman embodies the best of vintage charm while embracing all that modern construction and amenities have to offer. It sits on a level, landscaped lot of over 8200 square feet in the secluded Sammamish Trails neighborhood with easy access to trails and recreation in the protected hills behind, and close proximity to I-90. This is the ideal combination of classic style and luxury for those seeking the ultimate connected Northwest lifestyle with equal parts natural beauty and urban accessibility. The house presents an inviting Craftsman façade to the street, with large double hung windows, three gables and a grand entry porch that is defined by stacked stone columns and massive structural beams. Siding is a combination of painted clapboard and natural shingles with crisp white trim for a timeless look that blends into its natural surroundings, while a lush front lawn and footpath that leads from the street to the double entry doors convey a tranquil sense of formality and scale. The porch is a deep, wide and sheltering area that provides a welcome respite and outdoor relaxing area before experiencing the elegance within. An elegant and spacious formal dining room sits to the immediate right of the entry, offering an inset tray ceiling with recessed ambient lighting, intricate wainscoting, deep cove moldings and hardwood floors. The room looks out over the front yard, and connects directly to the kitchen via a wide butler’s pantry with a full wall of cabinets, built-in wine refrigeration and deep-stained hardwood countertops. The formal living room sits on the opposite side of the foyer from the dining room. It is flooded with natural light by two walls of large windows, and is anchored by a large fireplace, set into a marble and custom wood mantel with matching wainscoting and crown molding details. 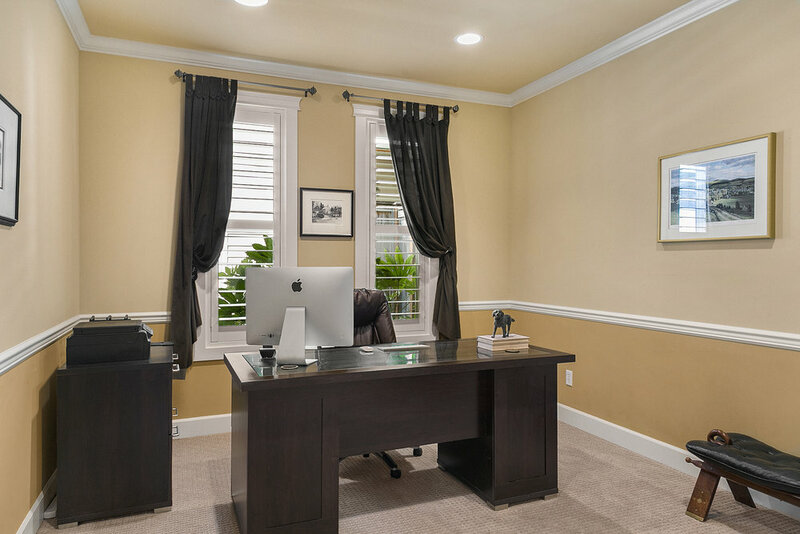 A spacious home office resides just behind the living room, entered through a pair of glass French doors, and offering two windows, recessed lighting, crown molding and chair rail with carpeted floors and network wiring. This is a private and autonomous space for the most demanding business needs, but it can also be used as an additional sleeping area or library. The central hall leads back to the kitchen and family room, which are flooded with natural light by a wall of oversized windows with a large bay that serves as a casual dining area. 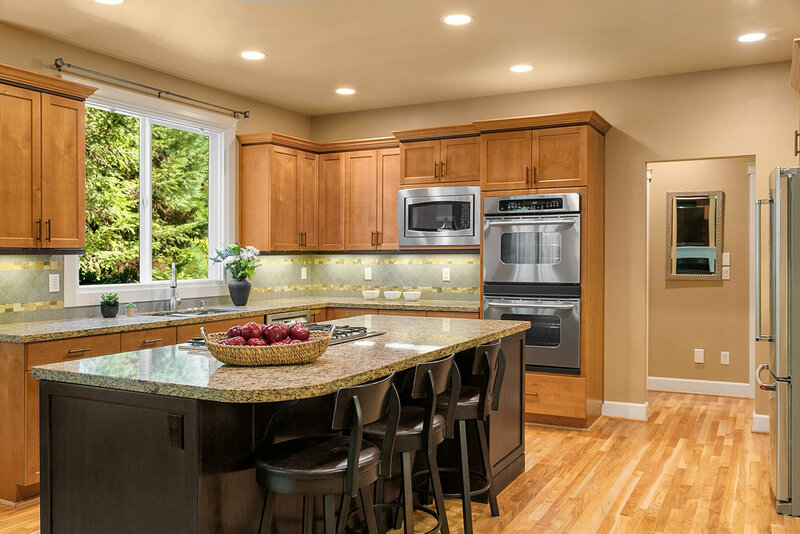 The kitchen is a spacious, high-performance cooking area with walls of custom alder cabinets and a central island finished in a contrasting deep espresso tone. It features a suite of new top-of-the-line stainless appliances, including a six burner gas cooktop with downdraft venting, double wall ovens and a built-in microwave. Counters are slab granite and backsplashes are crafted in an intricate stone and tile pattern, while a built-in desk is the perfect place for household management. Numerous recessed and under-cabinet lights provide great task illumination for this dynamic center of the home. 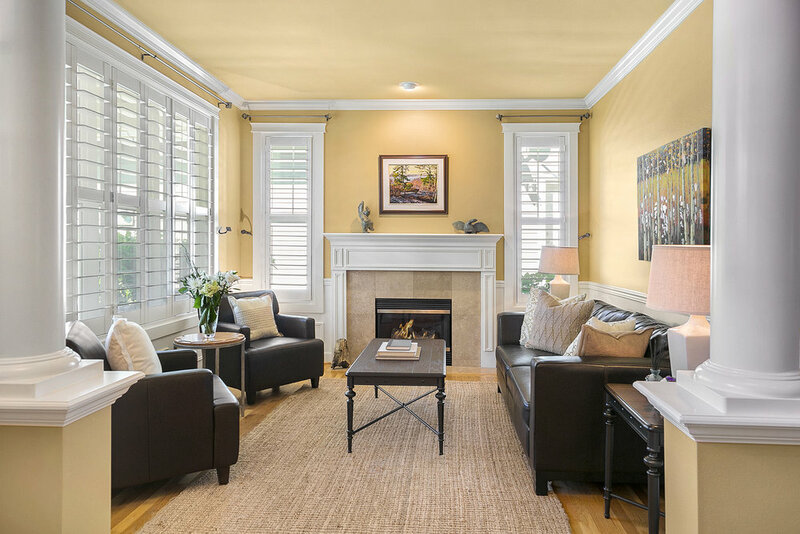 A charming casual dining area resides in its own bay, affording natural light from three sides, as well as easy access to the back yard patios. It connects the kitchen with the family area on the left side of the house. The family room acts as a wonderful extension of the kitchen, with a stately marble fireplace surrounded by a wall of built-in cabinets for storage and media. A TV nook and surround sound wiring complete this spacious and comfortable relaxation area, made more tranquil by restful outlooks over the backyard. The main level is completed by an elegantly appointed powder room, and offers direct access to the deep two-car garage through the kitchen. All mechanical and comfort systems are located in a utility room on the first floor and the house features central air conditioning for year-round comfort. 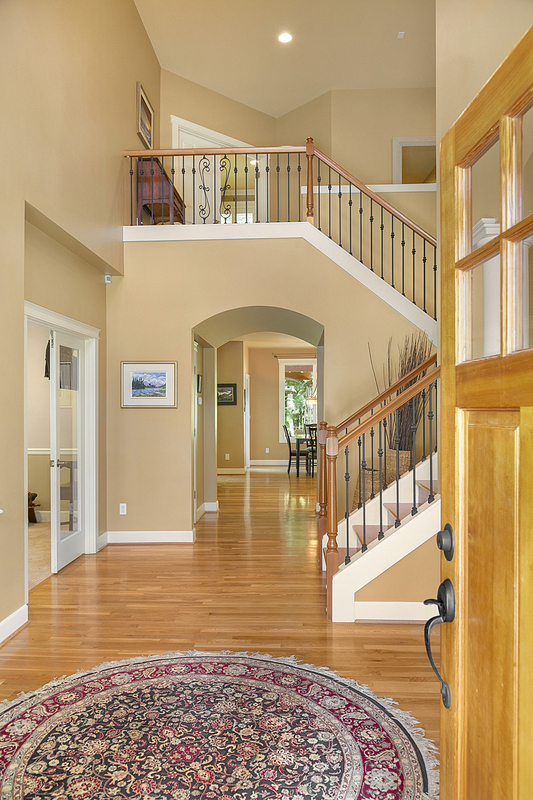 A grand hardwood staircase leads from the foyer up to the second floor bedrooms, baths and bonus area. All spaces feature hardwood floors, intricate molding and ceiling fans for unity with the main level, and large windows filter light through plantation shutters. The master suite is a spacious and private enclave that overlooks the backyard and resides in its own wing of the house. It includes plenty of space for a seating area, and includes an extra-large dressing room with a full compliment of custom storage built-ins with a charming window seat. 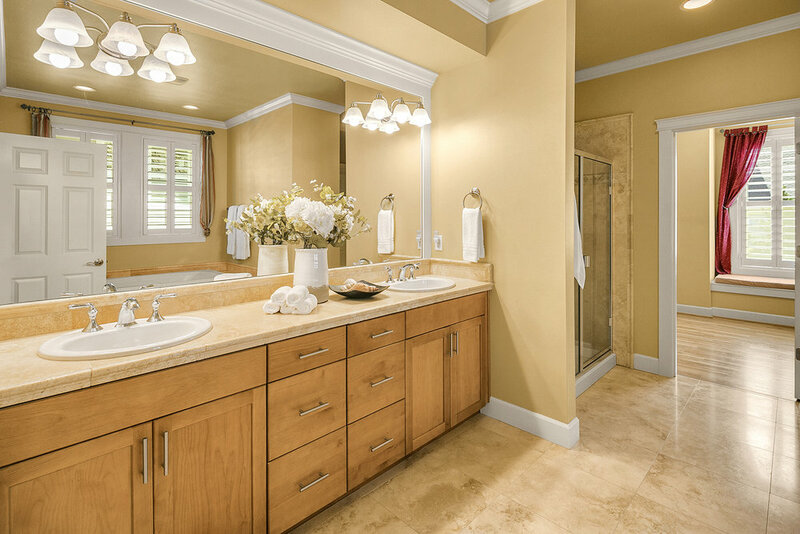 The master bath is a sumptuous retreat with a wall of vanity cabinets, two sinks set into ogee-edged marble counters, a large walk-in shower, a deep soaking tub in a marble surround and a private water closet. Large-format marble tile covers the floor and shower, while intricate crown molding maintains the house’s high level of architectural detail. A wide hall leads to three additional bedrooms and two baths. Two spacious bedrooms share an elegant Jack and Jill bath with a double sink vanity and separate bathing and water closet areas, while a fourth bedroom has access to its own full bath just off the hall. 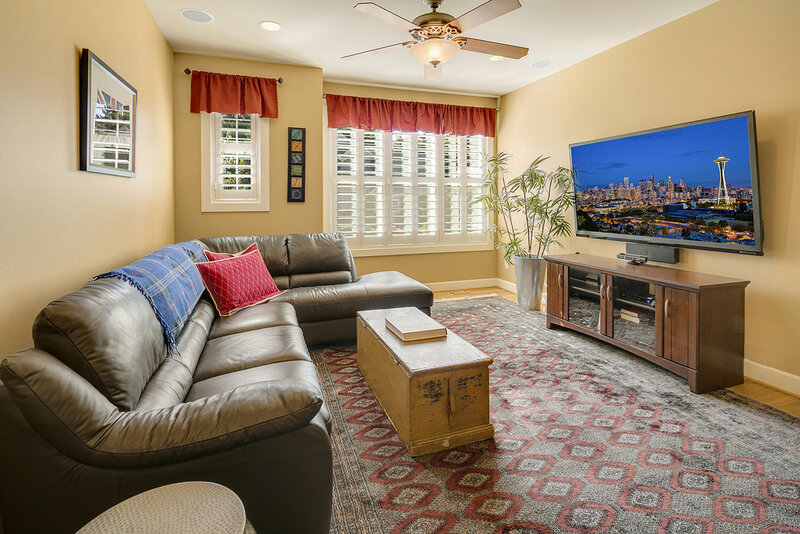 A spacious bonus room above the garage is set up to function as a comfortable and inviting media room with recessed lighting, high-tech wiring and a wall of windows for plenty of natural light. Upstairs finishes include alder vanity cabinets and designer porcelain tile in bathrooms and hardwood floors and warm neutral colors in all bedrooms. This is a sought-after arrangement for those wishing to keep the whole family on one above-main floor level, and offers great flexibility for guests. A glass door leads from the kitchen and family areas out to a pair of beautifully landscaped stone patios – one set under a dramatic heavy timber structure for year-round outdoor enjoyment, and the other out in the open and centered by a raised stone fire pit. A large hot tub is placed just outside of the covered patio and landscaped into the lot for a discreet and low-profile installation. The backyard offers plenty of space for open-air relaxation and dining and merges seamlessly with the protected natural space behind it, creating a lush and enveloping sense of privacy throughout the year. This is an ideal residence for those who seek the natural beauty of Western Washington while maintaining easy access to urban areas and exceptional schools and recreation. Sited in Sammamish Trails development just above Lake Sammamish, the home offers unparalleled options for outdoor enjoyment, from water-born activities on the lake to numerous golf courses, hiking and equestrian trails. With close proximity to I-90, ski getaways are less than a hour away, and Bellevue, Issaquah, Redmond and Seattle all provide dining, shopping and entertainment options too numerous to mention. The Issaquah schools are consistent award winners for academic excellence, and the surrounding area provides virtually unlimited options for sports leagues and extra-curricular activities. With timeless updated Craftsman style, every imaginable convenience and luxury and a modern, open floorplan that invites regular entertaining and casual living, this is the embodiment of the Northwest. The home offers tranquility, natural beauty, connection and comfort, and is as much an escape as it is a personal enclave within easy reach of Seattle and the Eastside tech corridor.